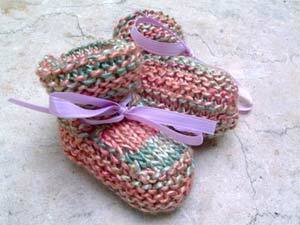 Handknit Baby Booties in pure, soft, handpainted silk. These incredible booties are the best. What could be better than whispery-light, super soft silk. Delicate and non-irritating, this is a perfect booty fiber. Great for wiggly toes that want something xtra special to wiggle in. Crochet Self Ties keep them on, silk makes them breathable and luxurious. No sweaty feet here - just a cinderella, or prince charming, moment. Make it a gift at checkout with our gift wrap and custom card option!